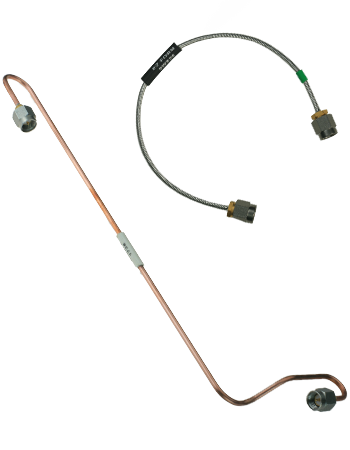 At EZ Form, every aspect of semi-rigid cable assembly fabrication is precisely controlled. The art of precision cable bending and trimming has been perfected over many years to a degree unequaled by any other manufacturer. Custom tooling is designed to obtain repeatability and optimum fabrication accuracy to meet every requirement. Total quality control (every assembly undergoes 100% mechanical and electrical inspection) ensures reliability and guaranteed performance. Phase-matched assemblies with tolerances of ±1 degree per GHz are certified in a fully-equipped electrical testing facility, backed by an engineering staff with years of experience in RF technology. Tighter specifications can be met by utilizing our proprietary techniques. Flexible cable assemblies are made with the same exacting precision used to fabricate semi-rigid assemblies. The latest in trimming and assembly equipment is used, and 100% inspection yields assemblies with long life under rough and continuous use. EZ Form Cable Corporation personnel have successfully completed a course of study on IPC/WHMA-A-620A, which is a standard that defines the Requirements and Acceptance for Cable and Wire Harness Assemblies, as developed and approved by the industry. These employees are officially designated as Certified IPC Specialists (CIS). The option of having expert EZ Form craftsmen custom fit assemblies to your chassis is also available, saving you time and the cost of layout and drawings. We offer this unique service to aid OEMs in the fabrication of prototypes and custom-designed chassis. By allowing EZForm to manufacture, fit, test, and install the cable assemblies for your chassis, you eliminate costly in-house design, engineering, and drafting time. All you need to supply us is your chassis with components installed and a schematic. Take advantage of our experience, service, and quality, and make your decisions EZ.